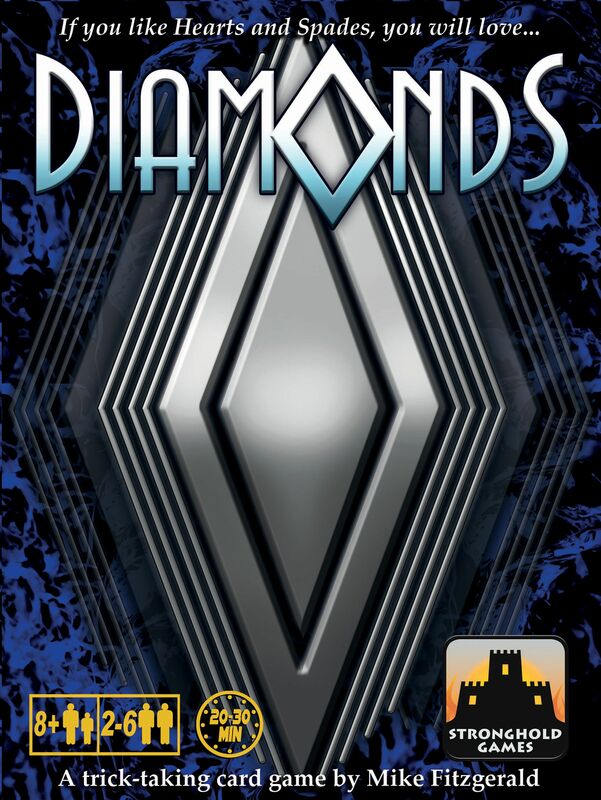 Diamonds is a trick-taking card game in which players collect Diamonds — not cards bearing that suit, mind you, but rather actual "Diamond Crystals" (acrylic crystals) included in the game. What makes the game of Diamonds different from other trick-taking card games is that when you cannot follow suit you get a "Suit Action" based on what suit you do play. Suit Actions are also taken by the winner of each trick, as well as at the end of a full Round of play. The deck in Diamonds consists of sixty cards, numbered 1-15 in the standard suits. In each round, the players start with a hand of ten cards. One player leads a card, and everyone else must play one card, following suit if possible. As you play a card, if you cannot follow suit, you immediately get a Suit Action in the suit you did play. The player who played the highest card in the suit that was led wins the trick, and also gets a Suit Action. The player who won the trick leads a card to start the next trick. After a full Round of ten tricks, whoever has taken the most cards in each suit once again gets a Suit Action. If a player has taken no tricks, that player gets two Diamonds Suit Actions. Players then start a new round.